As the past two weeks have shown, special teams have the power to win games and shape playoff races. But teams still spend little time to hone these critical units. You may recall that, on Oct. 17, Michigan State secured a win over Michigan in one of the most jaw-unhinging ways conceivable, at least until it basically happened again in Atlanta the next week. The Spartans rushed a punt, recovered a fumble after a bad snap and returned that in for a touchdown with no time left in a 27–23 victory. 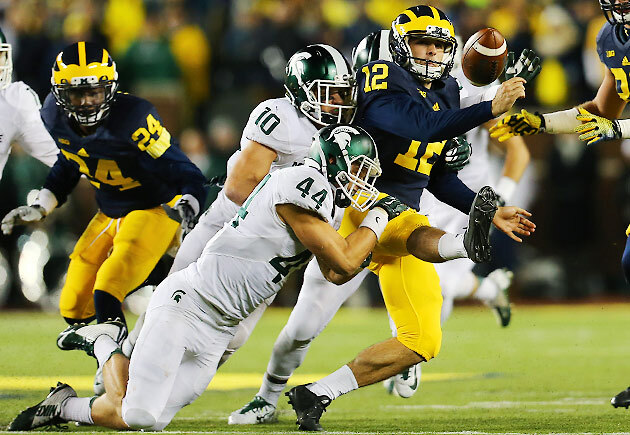 Though his punt block unit had placed some extra emphasis on getting after the Wolverines’ rugby-style kicker during the week, Mark Snyder was like everyone else watching that day: He could not have imagined that. But Michigan State’s linebackers coach and special teams coordinator swiftly discovered that other coaches had no trouble conjuring such a scenario. The calls he received from his peers following the stunning triumph generally were not meant for congratulations on a job well done. No, fellow coaches were reaching out to thank Snyder for reminding them to revisit that situation with their teams at midseason, to gird for a catastrophe that might never come, just in case it does. The very next week, Georgia Tech blocked a long field goal attempt and returned it for a game-winning touchdown with no time left against Florida State. Less notably, but no less consequential for the parties involved, Texas State returned a missed field goal 100 yards for a touchdown to blow open a game against South Alabama on the same day. These plays may be anomalies. But they exemplify the weekly challenge for coaching staffs nationwide, who must figure out a way to prepare for the worst in a very tight window to prepare their special teams at all. Snyder feels fortunate: His boss, Mark Dantonio, recognizes the potential impact of a given special teams snap. “He knows with the parity in college football nowadays, a couple times during the season, those are win-lose type deals,” Snyder says. Thus Michigan State carves out time before games for special teams work that is not superficial. Each unit has two 12- to 15-minute meetings per week and gets two eight-minute periods of live work during practice. It’s difficult to imagine any coach relying on months-old muscle memory for, say, an offensive play they intend to incorporate for a specific game. But the various situations that might occur on special teams, as potentially damaging as they may be, are almost too rare to be dwelled upon for any length of time. Indeed, when Michigan State decided to rush all 11 players at that final Michigan punt two weeks ago, the 11th man was a second-stringer on its “Ranger” punt block unit. “We haven’t done that since, phew, man, probably fall camp,” Snyder says. At Michigan State, the plan to offset the challenge of addressing everything with limited time involves several non-starters—literally. The Spartans coaches attempt to deploy as many players who aren’t down-to-down regulars as they can on special teams. It energizes a given unit; instead of first-teamers attempting to block a punt after grinding out a six- or seven-plays series, it’s backups unburdened by that workload. And those reserves also often have nothing better to do than to prepare during the week for all special teams possibilities. This is not a revolutionary formula; Snyder used it when he was the head coach at Marshall from 2005 to ’09, ensuring that the weekly schedule involved ample special teams work and having all plans run through him. Likewise, Clemson typically has a 20-minute meeting on its heavy workdays—Tuesday, Wednesday and Thursday—to discuss what will be covered during three special teams periods that day. That point is made clear year after year, even if it has been driven home with a sledgehammer over the past couple of weeks. It is impossible to overreact either way, though: If every team believes it is maxing out its special teams prep already, it won’t do more just to avoid future calamities because it essentially can’t. When the calamities occur, most teams are just thankful it didn’t happen to them and remind their team of how to handle those breakdowns, in the little time they have to do so. Each week, The Walkthrough will talk to two assistant coaches about a key upcoming matchup. For Week 9, it’s Washington State attempting to figure out a way to stifle a Stanford offense that is averaging 45 points per game in Pac-12 play. Roundtable: Which Power Five league will get shut out of the playoff? • North Carolina at Pittsburgh: The ACC Coastal round robin begins between the Tar Heels, the Panthers and Duke. All three are undefeated in conference play, and all three play each other in the next three weeks. • West Virginia at TCU: At some point, the Horned Frogs’ injury-plagued defensive shortcomings will haunt them. But it probably won’t be this week against a Mountaineers crew that has flopped in league play. • Oregon at Arizona State: In an alternate dimension, this is a hugely important game. In this dimension, it will make you tired at work on Friday. • Louisville at Wake Forest: Bowl eligibility is barely a consolation prize these days. But to get there, the Cardinals would do well to mount a three-game win streak, starting now and continuing against Syracuse and Virginia, before road trips to Pittsburgh and Kentucky to end the year. • Nebraska at Purdue: Mike Riley has many problems in year 1. He does not need a loss to the one-win Boilermakers to be another one of them. • Ole Miss at Auburn: Will Muschamp is getting paid $1.6 million to run a defense that ranks 88th nationally in scoring defense at 29.7 points allowed per game. Just saying. • South Carolina at Texas A&M: The reports out of Aggieland paint an ugly picture of mistrust and dysfunction, especially as it relates to quarterbacks Kyle Allen and Kyler Murray. This should be a get-well game. If it isn’t, the shine is completely off Kevin Sumlin. • USC at California: The Trojans got their catharsis with a win over Utah. The question is how consistent their emotions will be. • Clemson at NC State: Nothing about the 2015 Tigers indicates they’ll peek ahead to Florida State the following Saturday. Nothing about a Wolfpack team that scored 13 points against both Louisville and Virginia Tech suggests it has enough firepower to keep up. • Florida at Georgia: The Gators can effectively lock up the SEC East with a win. You wonder how much a bad Bulldogs loss here would amplify the howling about coach Mark Richt. • Oklahoma State at Texas Tech: Quarterback Patrick Mahomes was putting up mind-boggling numbers for the Red Raiders…until he threw four picks at Oklahoma. If he returns to the mean, could that end the Cowboys’ run? • Maryland at Iowa: The Hawkeyes have allowed just 36 points in Big Ten play. The Terrapins have scored just 58. Even Iowa’s offense suffers a bit of a slow start after a bye week, that defense should carry Kirk Ferentz’s club. • Vanderbilt at Houston: The Commodores rank 120th nationally in scoring offense. As good as their defense is, that just won’t be enough to derail this AAC contender. • Michigan at Minnesota: This is the first game for the Wolverines after the gutting Gift Six loss to Michigan State. This is also the first game for Minnesota after Jerry Kill's stunning retirement this week. Interim coach Tracy Claeys says he wants the full-time job. If he gets it, he'll have earned it: Claeys’s first three games are against Michigan, at Ohio State and at Iowa. • Notre Dame at Temple: It’s the biggest game in Owls history. That doesn’t make the Fighting Irish any less fast or athletic, and Temple’s best preparations in those areas (Penn State and Cincinnati) don’t really compare. • Stanford at Washington State: Luke Falk has completed 71 percent of his passes or better in all but two games. Such efficiency will be mandatory to keep up with the Cardinal. The Cougars’ defense can’t withstand Stanford’s physicality and turnovers from Washington State. We’ve got college football on Halloween, which means we could ring it in with obscure glam metal band Halloween and the single “Trick or Treat” off its 1985 album Don’t Metal With Evil. We could do that. But there’s nothing scary about the band Halloween. There is, however, something scary about the dark. Welcome to Week 9.